New photographs and drone footage of Tesla's "state of the art" Fremont production tent, which the company is using to "temporarily" boost Model 3 production, show that Tesla is using what has been dubbed "stone age" processes that fly in the face of the "alien dreadnaught" concept that Elon Musk had touted for the company's production. The following video taken on June 26 was uploaded on Twitter by a user who was able to capture footage of what the new temporary facility in Fremont California, which Elon Musk has gone to extreme measures to cover up such as putting trucks along the periphery fence to hinder onlookers, looked like. 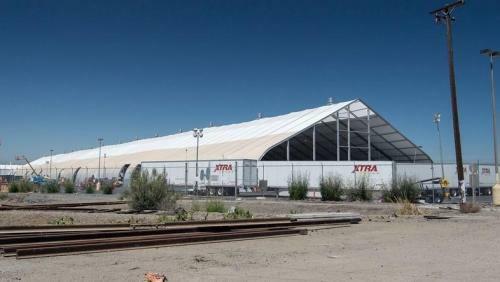 The footage provides the closest look inside the secretive tent facility ever made public, even as Tesla recently placed two large semi trailers in front of the facility to obstruct the view of the general public. The video, and the still shots captured from the video, uncover a hand-built assembly line and conveyor where frames are forklifted onto the line, according to the notes by the author on Twitter. As noted, the "assembly line is still being configured" and additional still images show that it may only be used for test vehicles or to make a "token" number of vehicles. 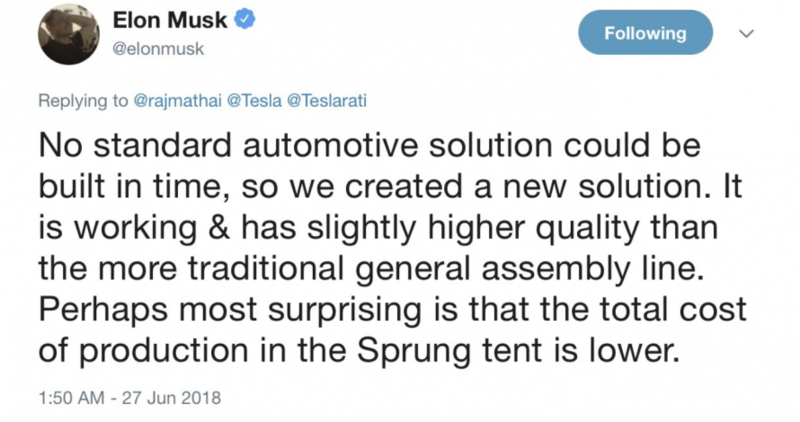 Despite all the clearly outstanding complications, Elon Musk made the following statement just hours after this video was captured, calling the tent assembly line "higher quality" than the more traditional general assembly line. Earlier this week we published a detailed note earlier this week talking about Bloomberg’s first look into this tent facility at Fremont. The tent was erected in just a matter of weeks, and came online in early June, to help the company produce more vehicles at a time when they are under the microscope. Until recently, we didn’t know the details as to when it was erected, what the timing looked like and what it is expected to produce. However, a Bloomberg article helped shed some light on the details of what is arguably the most important - if archaic - structure that Tesla has built yet. Not surprisingly, opinions extend the whole gamut, with some manufacturing experts claiming the tent is "basically nuts". Analysts at Bernstein are equally unimpressed. Here is a quote from Max Warburton who benchmarked auto assembly plants before his job as a financial analyst: “Words fail me. It’s insanity." In conclusion, we revert back to the anonymous user who recorded the drone video, who asks a pointedly rhetorical question: "when will Elon Musk stop lying to the public about what his company can achieve? Or, when will the public, regulatory bodies, and elected officials begin to hold him accountable?" When will Elon Musk stop lying to the public about what his company can achieve? Or, when will the public, regulatory bodies, and elected officials begin to hold him accountable?